Nice-looking, good-fitting harnesses made from 1000lb. test nylon webbing. All harnesses are double padded with black polar fleece. Double webbing trail is standard and available in blue or red webbing. Big snow hook with center plate and flat handle. Main line made of 3/8 inch poly rope, tugs made of 1/4 inch polyrope, and half inch brass snap tugs. Made in 2 dog sections that loop together. 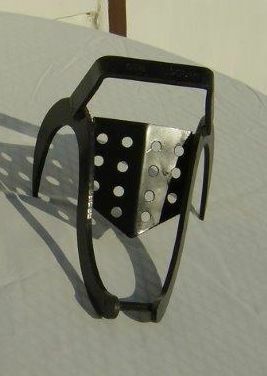 Lead dog section is made for double lead and includes double neck line. Heavy duty nylon webbing, red only.